Agricultural practices are having a disastrous effect on global insect populations. David Meyer Writer for Fortune. Two-fifths of the world’s insect species may disappear over the next few decades, and we could be looking at a world without any insects at all within a century. Given insects’ importance for sustaining plant and animal life—by pollinating plants and serving as a food source—that’s as dire a prediction as they come. 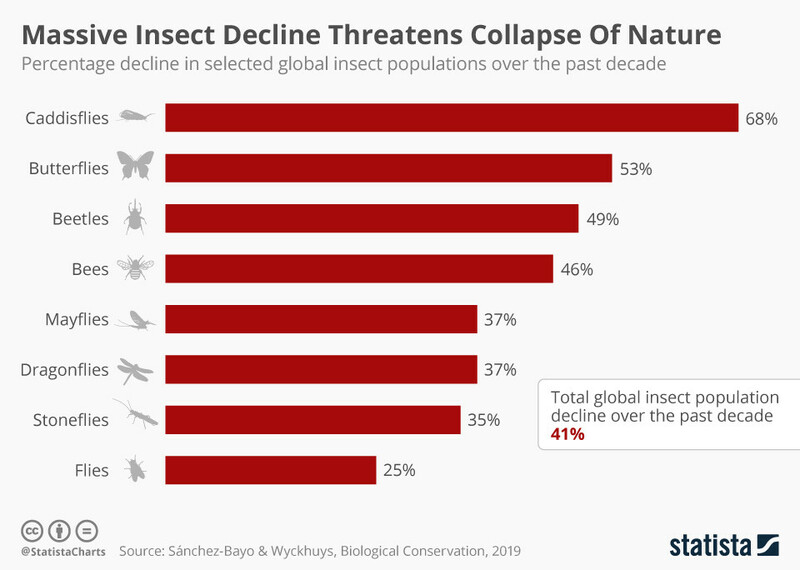 The projections are based on the downward trajectory of the world’s insect mass, which is thought to be falling by 2.5% per year. The culprits? Agricultural practices that rely on pesticides, the loss of habitats to growing cities, biological change such as the introduction of new species to habitats, and of course climate change. This is the first global review of its sort, though hardly the first story to point to an alarming decline in insect populations. Pesticides such as neonicotinoids have long been cited as a cause for mass bee deaths in North America and Europe, and last year scientists warned of huge insect losses in Puerto Rico—along with losses of the animals that ate them. David Meyer, Writer for Fortune.